Here at Corsican Places, we're constantly looking for ways in which to impress our guests in every way we can. We know that choosing where to base your holiday is an important factor, so we always make sure that each and every property we add to our collection has a wow factor – whether that's the location, the pool, the décor, and much, much more. Some of our favourite properties are those that boast incredible views, so here’s our top 10 views from properties within our collection. The views from Villa Prestige's clean-cut pool across Calvi's Bay and citadel are incredible, and when the sunset casts a golden hue over the town, you're in the best place to admire it. Discover more about Villa Prestige. 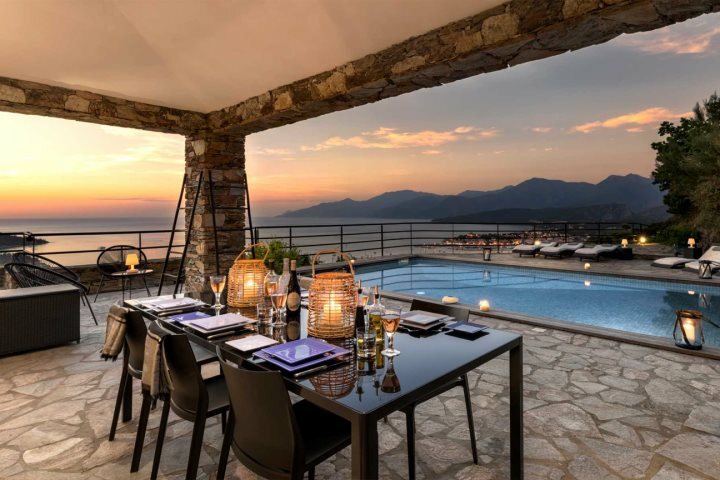 Neatly perched on the mountainside, close to Olmeto along Corsica's rugged west coast, the sprawling views down to the coast from the pool and outdoor terrace are second to none. Find out more about Bergerie Olivella. 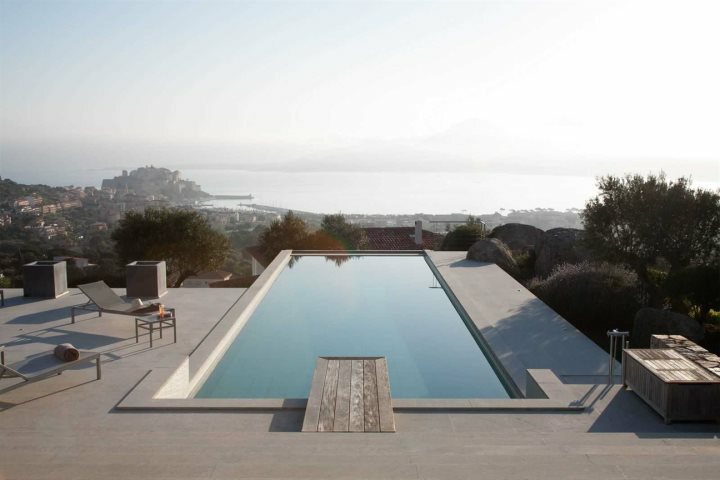 If you’re in search of uninterrupted sea views, Villa Davia is the one for you. Set in Marine de Davia, a privileged location between Calvi and L’Ile Rousse, relaxing in the infinity pool or on the rooftop terrace is the perfect pastime. Find out more about Villa Davia. 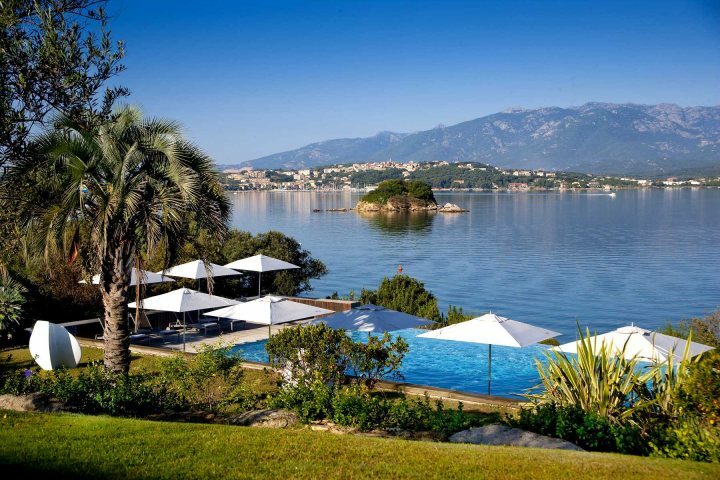 With a backdrop of the gulf of Porto Vecchio and the soaring peaks of the Bavella mountains, we’re confident you’ll be impressed with this four-star hotel in Corsica’s stunning south. Discover more about Hôtel Mariosa. 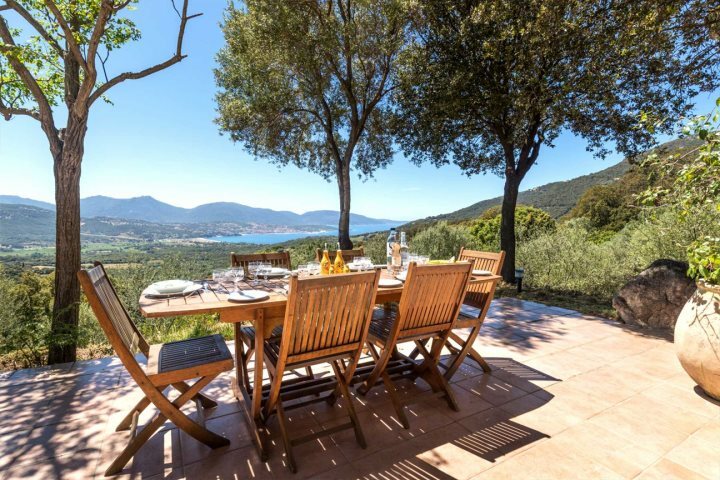 For sublime views towards the Désert des Agriates and the gulf of St Florent in the north-east, look no further than this stunning hillside villa. Find out more about L’Ancre Bleue here. It’s not often you’ll get the opportunity to stay within the ancient walls of a magnificent Citadel. 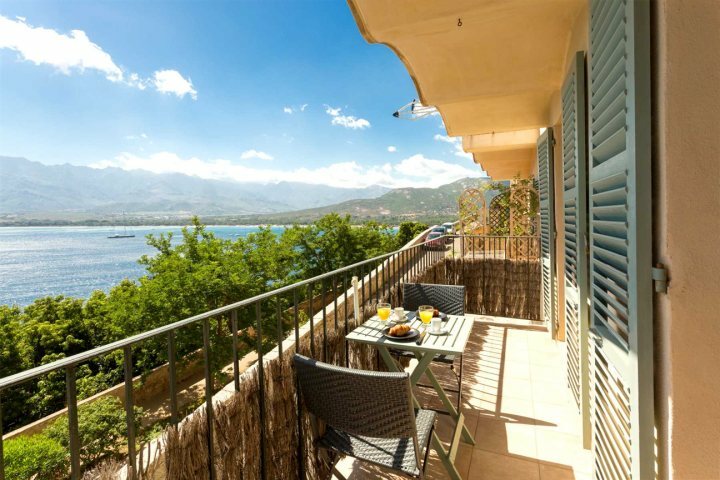 Soak up the bustling atmosphere and unrivalled views of Calvi bay from this studio apartment. Find out more about Studio Castille. 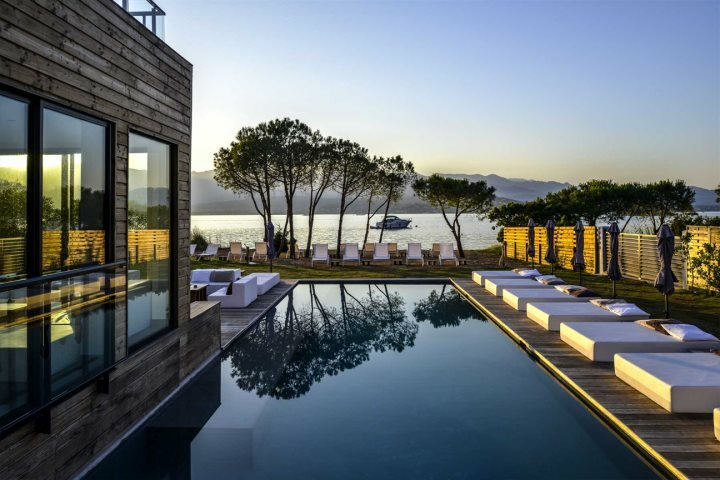 A refined, beachside hotel close to Porto Vecchio, from the grounds, rooms and infinity pool you can enjoy superb vistas across the gulf of Porto Vecchio and the mountains beyond. Discover more about Casadelmar. 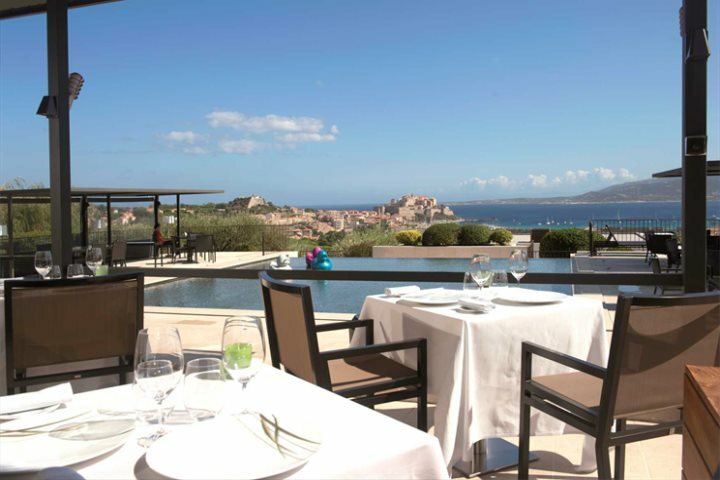 A stunning five-star property overlooking Calvi’s impressive bay and citadel, you won’t get bored of the views from both the infinity pool and Michelin-star restaurant. Find out more about Hôtel la Villa. 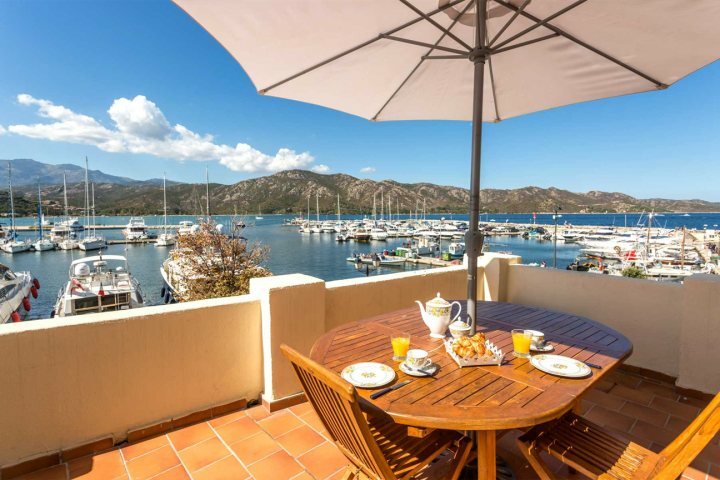 A beautiful little apartment right in the centre of St Florent, guests who stay here can admire the harbourfront views with a mountain backdrop from the property’s private balcony – the perfect place to enjoy an al fresco breakfast. Discover more about Chez Pamela. 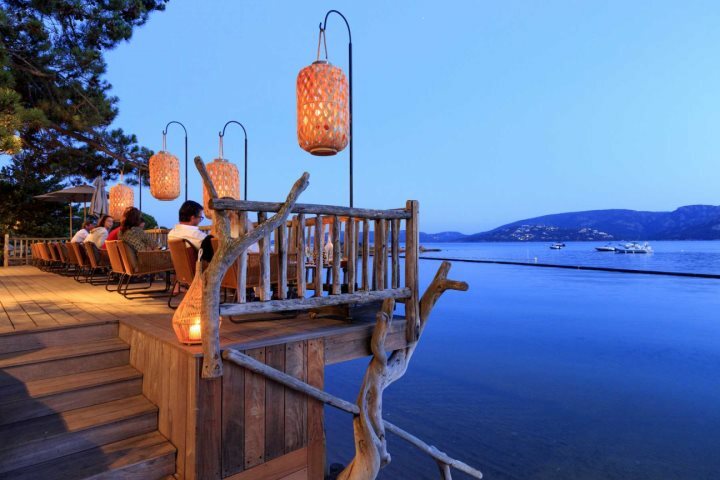 Located just north of Porto Vecchio, the elevated bar is perhaps the best place to enjoy these stunning coastal views in the south. Alternatively, relax under the sun on the hotel’s pontoon and soak up the sun, along with the vistas. Discover more about Grand Hôtel Cala Rossa. If you're tempted to find out more about a holiday to Corsica, take a look at our Holiday Ideas to find your perfect 2018 Mediterranean escape.